As a business, your success depends on getting your products and/or services in front of the right audience. Done right, business flyers can be a versatile and effective tool for reaching prospective clients while keeping marketing costs low. Creating beautiful and effective business flyers, however, can be a challenge, especially for small businesses who don’t know how to make a business flyer, and who may not have the budget to hire a dedicated marketing and design team to come up with flyer design ideas and create the best flyers for your business. Placeit can help. For a single affordable monthly fee, Placeit allows you to download unlimited digital assets. And with one of the largest collections of flyer templates on the internet, Placeit makes it easy for large and small businesses to create perfect business flyers every time. Placeit’s cutting-edge Flyer Creator is an online flyer maker that shows you how to make a flyer online without any special design software like Photoshop. With tons of flyer design ideas to choose from, all you need to do is select your favourite design, enter your chosen text into the flyer template, customise your design with available fonts, colours and graphics etc., and Placeit will generate the best flyers for you. Don’t worry if you have no idea where to start—the Flyer Creator also offers a number of template presets in your chosen design, which you can use as is or customise to suit your tastes. Best of all, as you create your flyer, you can make use of the state-of-the-art mockup tool at the bottom of the page, which shows you your flyer in a range of real-life scenarios. How cool is that? To whet your appetite, we’ve selected 20+ of the best business flyer templatesavailable at Placeit. If you’re creating a flyer for your law firm, you need it to communicate your professionalism, trustworthiness, and reliability. Look no further than the Professional Law Firm Flyer Design Template. With great images and graphics, coupled with strong fonts and muted colours, you can design the perfect flyer for your business needs in a matter of minutes. “Loveliest of lovely things,” the poet William Bryant said of flowers, so it’s no wonder that the Business Flyer Maker to Design Flyers for Florists template delivers a design that matches the beauty of flowers. Featuring a selection of pastel-hued gradients for backgrounds, this flyer design template also includes a variety of flower graphics, including orchids, roses, irises, lilies, peonies, flower wreaths, and more! If you have a landscaping business, it’s critical to show your customers examples of how your service could transform their property. That’s why the Flyer Maker for Landscaping Business with Images template shows off properties with great landscaping. You can use the images provided or include your own examples for more authenticity. Either way, potential customers will be WOWed by your landscaping skills. If you have a fitness business and are wondering how to make a flyer that will attract more clients, the answer is in one of our Gym Flyer Maker flyer templates. This template and its presets offer gorgeous images of bodies in motion, bold, eye-catching fonts, vibrant colours, and energetic graphics. Perfect for your gym, fitness centre, boxing gym, yoga studio, or any other fitness business. If you want to attract the right employees for your business, then you’ve got to create business flyers that communicate what your business is all about. With the HR Businesses Flyer Template and its incredible collection of professional images and business-related graphics, you’ll be well on your way to doing just that. You’re a farmer. There’s a food festival coming up, and you want to make sure potential customers know you’ll be attending. How do you make a flyer online quickly and easily? Flyer Creator to the rescue. The Food Festival Flyer Template communicates an abundance of colourful, fresh, seasonal produce—all the qualities you need to attract potential clients. In minutes you’ll have created your design and be ready to head to the printers. Want to know how to make a business flyer for your handyman business? We have just the thing for you. The Flyer Design Maker for Handyman Businessestemplate helps you to create the best flyers quickly and easily. With gorgeous home-improvement graphics and images, strong fonts and gorgeous colours, our flyer templates will help you produce professional results every time. Are you looking to create beautiful horizontal flyers that will inspire your potential customers to choose your interior design services? 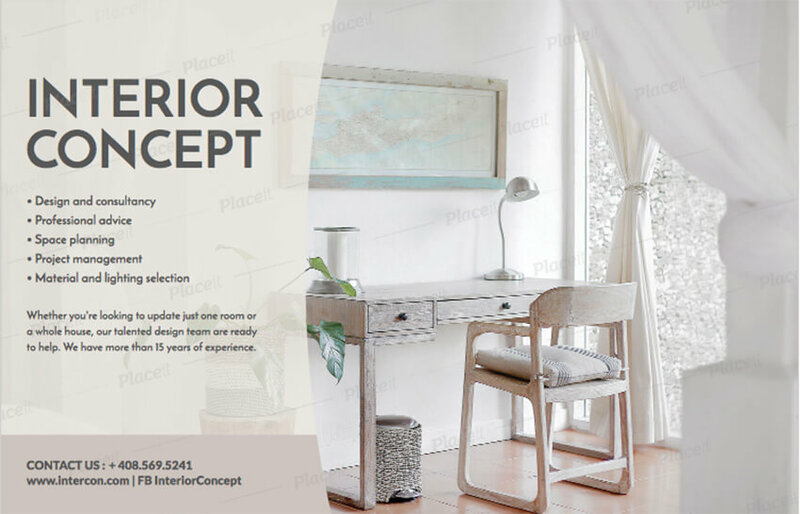 Horizontal Flyer Template for Interior Design Flyers is the right template for you. You can choose our main template or select one of the presets that appeals to you. Either way, you’ll be able to customise every aspect of your flyer and upload examples of your own work. Of course, if you’re just starting out and don’t have many of your own examples, our Flyer Creator provides you with a selection of amazing images that you can make use of. Event planners will be happy to discover the Online Flyer Maker for Corporate Events template, which caters specifically to their need for a professional corporate flyer. There are a number of background images provided to suit a range of tastes and brands, so whether you’re promoting a corporate event, advertising your services, or making a business announcement, this online flyer template will help you get your message across. Everyone dreams of travelling at some point in their lives, but how do you reach those who are ready to realise their dream? A great place to start is to get their attention with your own amazing flyer created using the Flyer Template for Travel Experience Business. With its gorgeous images, bold, modern fonts, and alluring colours contained in this template and its amazing selection of presets, who could resist contacting your business for more information? The Makeup Business Flyer Design Maker helps you create the perfect beauty business flyer for your hair and/or nail salon, makeup classes, special beauty deals, and other beauty related services. With this Flyer Creator template, you have not only the usual choice of font styles and backgrounds, but also a terrific selection of decorative fonts and graphics to choose from. If you’ve got a financial business, you know that your marketing materials need to communicate responsibility and professionalism. That’s exactly what our Financial Flyer Design Maker template and presets are designed to get across to your prospective clients. We’ve assembled just the right fonts, colours, graphics, and background images to inspire confidence in your brand. But, of course, if these don’t quite resonate with your brand, you can modify them all to suit your taste. Starting your new house cleaning business? Use House Cleaning Flyer Maker to let people know what services you provide. Our clean, modern designs are easy to modify to suit your message, and if you ever get stuck, remember there’s no need to re-invent the wheel—just help yourself to one of our beautiful presets, change the text, and head to the printers for your brand new set of gorgeous flyers. Do you want to create a stunning flyer for your hair salon business, to inspire potential customers to use your services? Flyer Creator has you covered. Not only are the images in Hair Salon Flyer Template stunning, but the graphics and fonts will make your flyer stand head and shoulders above the competition. Don’t forget to check out your design in our life-like mockups at the bottom of the page. You’ll be thrilled to see how your flyer will look in real-life situations. Accountants will love our Business Flyer Maker for Accountants template, which can be adapted for several purposes: to advertise your accounting, payroll, tax services, etc. Though the template and its presets communicate trustworthiness and professionalism, they’re by no means staid. They use a cool, modern design with fresh colours and fonts to make your business stand out. And, of course, as is the case with all the templates featured here, you can customise all of these elements to suit your taste. Whether you’re running a construction business or are an architect, contractor, sub-contractor, or carpenter, the Flyer Template for Construction Flyers will help you create an eye-catching flyer for your business. What makes this template incredibly versatile is the extensive number of icons available, including construction workers, hardhats, gears, blueprints, hammers, homes, and more, and the excellent range of images, appropriate for any business involving construction. Design an attractive flyer for your jewellery business in minutes with the Online Flyer Maker to Design Jewelry Flyers template. Whether you’re looking for a flyer to announce your latest collection or your participation in a trade show, this online flyer maker is the perfect tool to get your message across. The template offers a great selection of images which will appeal to different clienteles, and there’s also a nice range of graphics available. One of our best flyer templates for businesses needing to create a flyer for corporate events, conferences and/or business announcements, Online Flyer Maker to Design Business Flyers will make your potential clients sit up and take notice. Aside from the great images and large font selection, the template includes a number of cool background effects which add a bit of flair to the design. The Roofing Services Flyer Template takes all the work out of designing a professional flyer for your roofing business. Either select one of the stunning presets on offer, add your text and use as is, or if you’re feeling creative, use the ever-so-easy Flyer Creator to design your very own unique flyer. Either way, you’ll have a business flyer ready to use in no time at all. Create an amazing flyer to promote your nutrition business in minutes and let potential clients know you’re there to help them live a better and longer life. The Flyer Maker for Nutrition Businesses template is pretty, alluring, modern, and takes the stress out of creating your flyer so that you can focus on giving your customers great service. We round out our list of the best business flyers at Placeit with Conference Flyer Maker, a great template for businesses that want to advertise any type of business conference. Like our other corporate flyer templates featured here, this one communicates responsibility, professionalism, and trustworthiness. With endless customisation possible and a number of presets to choose from, this should be the go-to template for any business that regularly runs conferences and needs a reliable source for template design ideas.